General Electric Chairman and CEO John Flannery addressed investors at a meeting in New York on Monday. General Electric Co. was embraced by local power brokers when the company arrived in Boston last year, validating their view of the city as a global player. Investors? They’ve got a decidedly different opinion of the company. GE is the Dog of the Dow, the worst-performing stock in the blue-chip index. The shares have dropped by more than 30 percent this year amid concerns that the company’s leadership wasn’t doing enough to control expenses or capitalize on its big investments. CEO John Flannery, who took over in August when Jeff Immelt retired sooner than expected, is charged with restoring the kind of steady growth that once made GE a Wall Street darling. On Monday, he will be in New York to detail his plans to get GE back on the right track. The 30-year GE veteran has signaled what’s on the agenda: cost-cutting, including layoffs, asset sales, and wiser deployment of the company’s money. Also in his sights is GE’s corporate culture: Candor and accountability are the new watchwords. “There needs to be real change, and you should know that this team is committed to that,” Flannery, 56, promised analysts last month. Flannery has already taken clear steps to send signals to the troops: selling off the corporate jets at Hanscom Field, ending a car service available to some 700 employees, moving a January retreat from Boca Raton, Fla., to Boston. He reshuffled his leadership team and helped reduce expenses by $1.2 billion this year, including through job cuts that are underway. But many questions remain for investors: How will Flannery find more ways to deliver on a promise to trim $3 billion-plus from the company’s budget over two years, as well as divesting up to $20 billion worth of business lines? Will he shave the once-sacred dividend, thin out an unusually large board of directors, properly fix the company’s opaque accounting approach, or sell off a core business? Bostonians, meanwhile, might worry about what this slimmed-down GE means for their city. Flannery’s review has led to a two-year delay in completing GE’s new headquarters complex in Fort Point, though company reps say they still plan to go forward with the $200 million project. GE also has reassured city leaders of its long-term plans to employ 800 people in the city by 2024 — a promise made in return for $25 million in property tax breaks over 20 years. GE also says its pledge to spend $50 million on local philanthropic efforts over five years remains intact. But the ongoing reductions to the company’s nearly 300,000-person operation will inevitably affect GE’s Boston workforce, which includes about 250 people in temporary digs on Farnsworth Street and 50 at GE’s Current division, which focuses on lighting and energy, near South Station. Company officials say the impact on the local workforce should be limited. Nick Heymann, an analyst with investment bank William Blair & Co., said the process could benefit Boston, despite the short-term pain and uncertainty. Current might be sold off, or the headquarters project could be scaled back. But Heymann said Flannery’s steps should make GE a stronger company, even if it looks quite different two years from now than what it looks like today. Like Immelt, Flannery is looking to make big changes to GE. But Flannery is trying to make these changes as quickly as possible. “Flannery is much more of an operator, someone who digs down into the finances and understands what’s going on within the business than Jeff had been as a CEO,” said Martin Sankey, an analyst with Neuberger Berman, a New York-based investment firm. Immelt sought to build an industrial-focused company, one that used software and data to make big machines run more effectively and efficiently. That meant selling off NBCUniversal, most of GE Capital, and the appliance division. Meanwhile, he plowed money into a software business known as GE Digital and some big acquisitions, such as the $10 billion purchase of Alstom’s power businesses. Among the most notable developments under Immelt’s tenure was the arrival of activist investor Trian Fund Management. Initially, the relationship seemed friendly. But matters turned terse earlier this year, as Trian cofounder Nelson Peltz apparently grew frustrated with the languishing stock price. Immelt agreed in March to chop $2 billion out of the budget over two years as part of those discussions with Peltz. It wasn’t enough. The stock continued to slide. 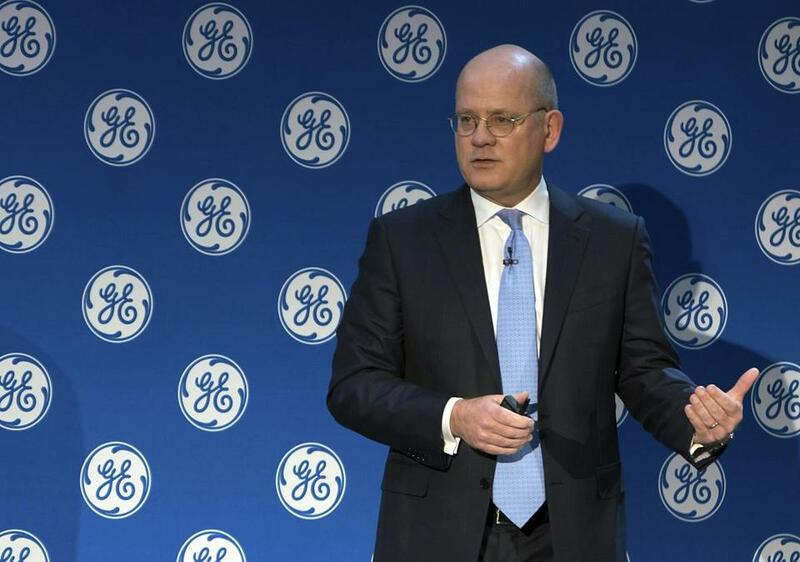 GE’s board kicked its long-simmering succession plan into high gear. Immelt was gone. Trian’s chief investment officer, Ed Garden, had a seat at the table. Flannery, who added the chairman’s title in October, has spent the past several months on two efforts: meeting with shareholders to gauge their concerns and with employees to find efficiencies. For a conglomerate the size of GE, one that generates more than $120 billion a year in revenue through operations in more than 170 countries, this isn’t an easy task. Flannery said there are no “sacred cows.” But internal politics can get in the way as fiefdoms are protected. If Mayor Martin J. Walsh and his team in City Hall are worried, they aren’t showing it. Flannery met with Walsh in August to discuss the decision to delay the new headquarters. Business leaders in Boston don’t seem alarmed, either.